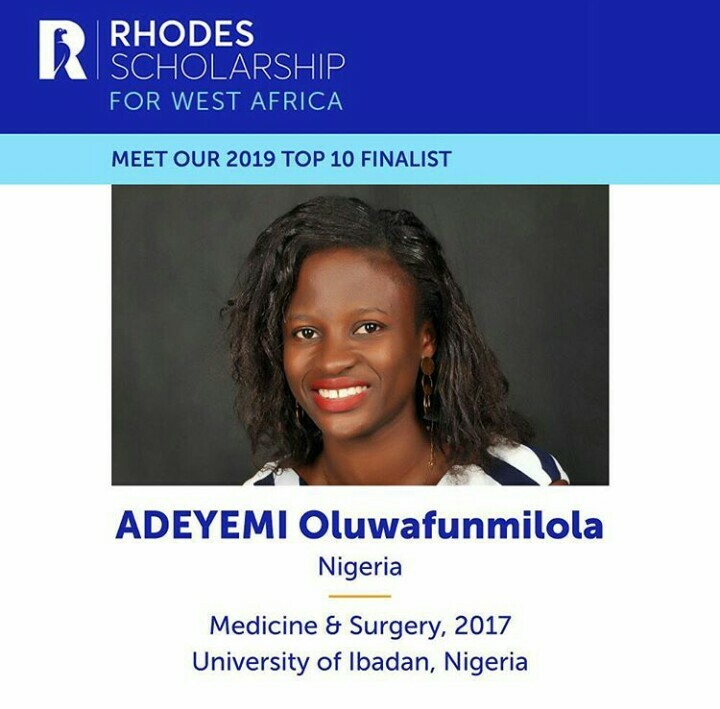 24-year-old Nigerian Doctor, Adeyemi Oluwafunmilola, popularly called Funmi, has emerged as one of the top 10 finalists of the 2019 Rhodes Scholarships for West Africa. Funmi, a exceptional brilliant member of the 2k13 graduating class who graduated with honors from University of Ibadan (UI) Medical School, made it to the final round selection process of the scholarship program. Rhodes Scholars are chosen on the basis of the criteria set down in the Will of Cecil John Rhodes, who established the scholarships in 1903. Academic excellence is a major prerequisite for selection but it is only a threshold condition. Other important criteria include moral force of character, commitment to service and the instinct to lead. The Rhodes Scholarships cover all university and college fees, a personal stipend for room and board, health insurance and travel, as well as the costs of the Rhodes Leadership Development Programme at Rhodes House. Depending on the course of study, the total value of the scholarship could range from £50,000 to £60,000 per annum, with the average tenure for a Rhodes Scholar being 3 years. 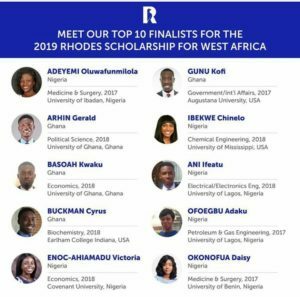 Two individuals from West Africa would be chosen from the top 10 finalists to join 93 other “scholar-elects” from around the world to commence studies at the prestigious University of Oxford, United Kingdom. It is worthy of note that 24-year-old Nigerian Doctor, Toluwalase Awoyemi, a UI medical graduate from the 2012 class, won the 2018 edition and UIMSA PRESS is confident that Funmi would bring the prize home. Funmi is keenly interested in preventive medicine and reducing deaths from non-communicable diseases. She is currently doing her house job in University College Hospital, Ibadan. UIMSA PRESS wishes her success in the final round selection process of the Rhodes scholarship program for West Africa. All the best Dr. Funmi as you make COMUI proud. Thanks for the read..Do share the idea with your friends and loved ones too.